Catherine -- probably age 7 (I REALLY need to make those photo albums) -- getting ready for Santa's arrival. One of the great things about being a parent is a chance to reconnect with your own childhood –something Basil and I do with gusto at this time of year. Playing Santa is perhaps a parent’s biggest pleasure — even when the kid would rather play with the box than the present in it, as Catherine did many, many times. Put out cookies — and carrots! — on Christmas Eve. Eating the cookies was no big deal, but remembering to take reindeer-sized bites out of the carrots and strew them on the front lawn required a little extra attention in the wee hours. Arranged for letters from Santa to be written to her after she sent her (overlong) wish lists. Hung the stockings and took the pictures. Read “Twas the Night Before Christmas” and “Mr. Willoughby’s Christmas Tree.” Every year, without fail. Logged on to the Norad site to see where Santa was and whether he was near. We added our own touches, too. Santa always left something new not just under the tree, but by Catherine’s bedside, too. Slippers, usually, and a candy cane. 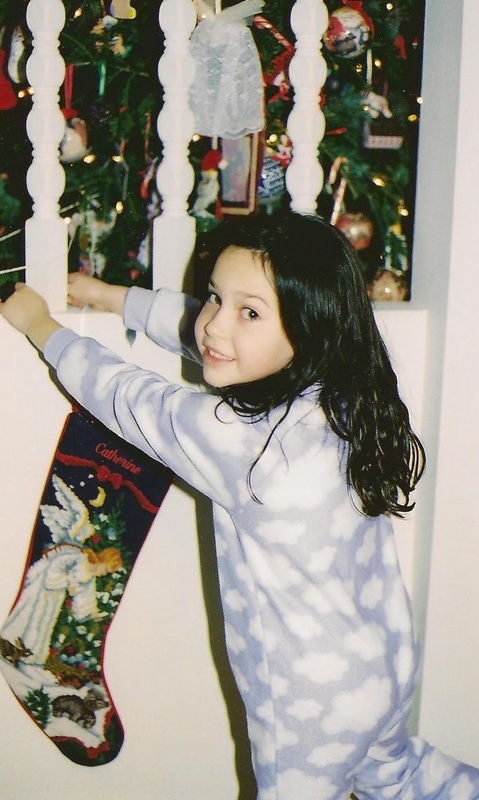 Our shining Santa moment, however, was the year we glued glow-in-the-dark stars to her bedroom ceiling while she slept. She was about 4, and I can only imagine how very comical it would have been to watch me and Basil climbing up the step stool to affix these things while she slept. Every sigh and movement she made sent us scurrying from the room only to tiptoe back. Morning brought high excitement. Santa had given her the moon and the stars. Indeed, St. Nick was an enormous presence in our house. So, what I’m about to confess may scandalize you. Avert your eyes if you must; read on if you want to feel better about your own parenting skills. We parsed the details — How did he get through the skylight? Why didn’t she hear him? The cookies would be gone in the morning and the carrots were always eaten. She always got some of what she asked for. Several times she told me she did. So I gave her the truth as I remembered my Dad explaining to me: Mom and Dad play Santa, but he is bigger than any two people. All of us together keep his giving spirit alive and now that she was a big girl, she could help, too. I grossly underestimated the impact of the news I thought she merely wanted confirmed. She sobbed for a good long time. I felt like crap, and it is one of a very few times that easy-going Basil really read me the riot act. I had a long string of “mother of the year” moments to my credit — spilling a month-old Catherine out of the stroller at Tod’s Point, slamming her chubby little fingers in the door jamb, not believing her when she claimed illness — but this one took the cake. Yes, I am the mother who told her child Santa wasn’t real. It seemed right at the time — she surely knew the answer or wouldn’t have kept asking. Still, I wished for a do-over. Moreover, while I know that no red-suited guy makes his way through the skylight on Dec. 24, I do believe. And I want Catherine to embrace that spirit of hope and goodwill, too. Amid the stress and angst, this time of year can bring out our best selves if we let it. For every lunatic fighting for the last Xbox, there are enormous numbers of people doing kind and generous things, offering love, comfort and support to others. The trick is in striving to “keep Christmas all the year” as Dickens had Scrooge learn to do. That’s our focus now, and Catherine is happy to “play Santa” — remembering kids who aren’t as lucky as she, buying and wrapping surprises for Dad and her grandparents, helping deliver sweets to our friends. She hasn’t given up writing her wish list (it’s very detailed, natch), and come Saturday night, she’ll still set out a plate of cookies. But before heading up to bed, she’ll wrap the last few presents and stuff a couple of stockings. After all, Santa can’t do the whole job by himself.